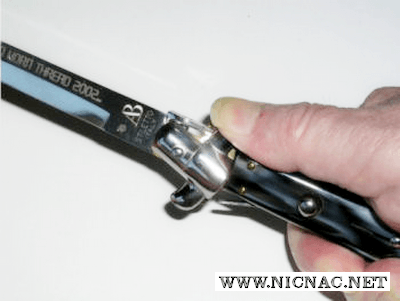 Italian Switchblade Stiletto Knives - See the picture that's worth a thousand words on how to close a classic Italian switchblade. For the classic Italian Switchblade, all that is needed to close it is to simply push down on the top bolster with your thumb to release the lock to close the blade. How to open close Italian Stiletto Switchblade Knife video by Horizon Bladeworks.